Incredible waterfront escape. Quaint cottage a few dozen feet from the water's no bank beach. Watch the boat traffic, State ferries, wildlife or the occasional whale. Enjoy the front porch watching the sunrise or sunsets. Less than 5 min walk to historic Manette where you will find restaurants, shopping & entertainment. Cozy one bedroom cottage fully furnished with amenities to enjoy your stay. Amazing views of the Puget Sound. Electric fireplace, gas BBQ, fire pit and outdoor seating. Perfect for s'mores! WiFi and cable with HBO provided. Easy access (4 stairs) to the water/beach from City lot next door. Parking on the street in front of the house. Enough room for 1 or 2 mid-size vehicles. Bring your walking shoes, bicycles, kayaks or paddle boards and enjoy paddling over to the Bremerton Marina or the Boat Shed restaurant is just around the corner and has a dock to tie up and enjoy lunch or dinner on their huge deck. During the season, bring fishing poles or crab pots! Neighborhood overview: One way street with many waterfront homes. Parking area on the street for guests. In less than 5 minutes, walk to downtown Manette and get a pastry at Sabateur bakery or Larry and Kristies. Visit the Bridge Deli for an espresso or sandwich. Take a stroll through the Manette Garage. Enjoy a wonderful dinner at one of the highly recommended restaurants such as Boat Shed, La Fermata (Italian), Nightshade (vegan) or the Honor Bar. Walk across the Manette Bridge over to Evergreen Park and try and find the "face" made of concrete near the boat ramp. The park features seasonal Farmers markets to enjoy the local vendors. Kitsap Transit Bus is 1 block away. Washington State Ferries and Kitsap Transit Fast Ferry to Seattle is 5 minutes away (20 min walk); Kitsap Transit ferry to Port Orchard is also 5 minutes away. This is a waterfront home that sits on a no bank beach. Walking distance to shopping, dining and entertainment. 20 minute walk to State and Local ferries for a quick commute to Seattle or Port Orchard. What a great place to unwind! 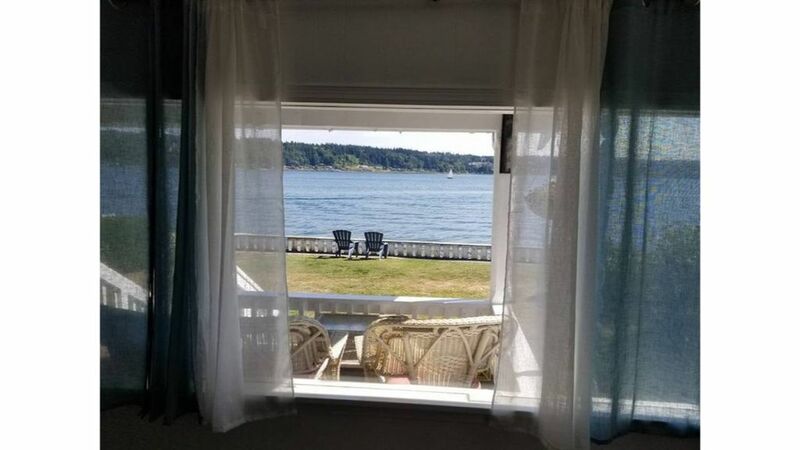 This beautifully appointed vintage waterfront cottage in the quaint village of Manette is quiet, secluded and well-equipped. The only noise we heard was the occasional eagle's scream and a ferry's horn in the fog...which by the way, is a great way to enjoy a leisurely crossing to Seattle. Seattle's ferry landing is just blocks from world-famous Pike's Place Public Market, an adventure worth the time. The cottage was stocked with far more than we expected. The owners have gone out of their way to make it cozy and reminiscent of the 30's when it was built. Bravo! The sudden departure from the hustle and bustle of the Seattle area is astounding...no crowds, no traffic, just a peaceful waterside place to relax. Truly a remarkable Pacific Northwest gem. Farm's cottage is fabulous. Dawn has thought of everything you could possibly need and the waterfront views are amazing. We had the best time. Would most definitely come again. Wonderful waterside cottage with all the conveniences of home. The cottage lives up to its description. Beautiful views from inside and out. Very clean. Kitchen was very well stocked. When we were faced with some construction issues next door, Dawn and her husband were quick to apologize and compensate us for the inconvenience without us even complaining. We would love to stay here again if we ever return to the area. Evan though a change in the weather did not allow for much sitting on the porch, the view from the picture window was almost as good! My husband and I spent a week at Gram's Cottage and enjoyed watching the ferries and boats go by as well as birds, ducks and an occasional seal. Dawn has done a great job thinking of all the things a guest might need and supplied little extras to make our stay enjoyable. We took the ferry often to go to Seattle and it was easy to navigate the trip. There are nice restaurants and coffee shops within walking distance. All in all, Gram's Cottage was exactly as advertised. Thank you! It was everything I was hoping it would be! Amazing location, view, super cute and clean, a pure delight. Loved every minute. Our stay at Gram's Waterfront Cottage was amazing. It was the most relaxing time that we have had in a long time. It was comfortable, just the right size for us and just minutes from our friends that we were visiting in Bremerton. We totally enjoyed sitting on our porch having coffee in the morning, watching the ferries and other boats on the water, and sitting outside in the evening watching the beautiful moonrise and listening to the water. We so enjoyed our stay. Thank you! So happy you all had a great vacation! Come.see us again. You can walk or bike to most shops and restaurants. The Bremerton water fountains are nearby, Evergreen Park, the YMCA and Bremerton Marina to name a few.